Have you ever touched the stars? To have a golden conversation with a brave heart Soldier was like, I am flying to touch the stars even without wings. It has changed my lookout towards life. A man who had spent 14 years of his life to serving the nation as a Lieutenant Commander at Indian Navy. 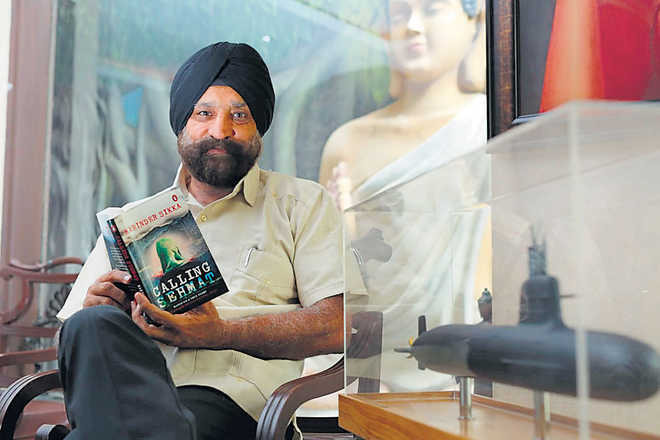 A renowned author of the no.1 bestseller book “Calling Sehmat”. The producer of the National Award Winning film “Nanak Shah Fakir.” The man behind the film “Raazi” by Meghna Gulzar. The second Indian to be awarded “Outstanding service in the field of Anti-Counterfeiting in India’ by the global anti-counterfeiting group, Paris. The man who achieved ‘Indira super achiever award’ in 2005. One man with multi talents. Yes, the one and only Mr. Harminder Sikka. In the busy world like today’s, when the members of a family barely have time for each other, this gentleman gave me his exactly 42 minutes. “Have patience bachha, we have all the time,” he said and all my worries flew away. I approached him through a text, I had no clue what his response would be, whether he would consider about me or not but all my excitement found it’s ride when he replied positively and blessed me by giving me a chance to converse. Let’s not say it an interview. It was the precious conversation with a man with Golden Heart. Me: Sir, you have been a soldier, a bestselling Author, a film Director, Producer and now a Group Director, business strategic at Piramal Group. How do you feel about it? Sir: I have been privileged to know ‘Sehmat Khan’ for 18 years now. She told me that there is only one reward in the whole world and that is karma. If the Lord grants you Karma, there cannot be a better reward. I am rewarded with Karma. So it doesn’t matter whether I get the best anti-counterfeiting award. Whether I don’t get any recognization or I get any. Does it really matter? who knows who remembers anybody in life? That is the one reason she (Sehmat Khan) wanted to go unsung because she had only one relation and that was with Almighty. She had a connection with him and I can prove you that. When I went to her with the manuscript. She asked not to make any film on her but on Guru Nanak. I told her I don’t have enough finance to make it but she told me that I would get that income from home only. I produced the film ‘Nanak Shah Fakir’ for 40 crores, which were out of my capacity but I did. I met all the thugs on my way. People came people went, they tried to ban it but the film won three national awards. The film went to Cannes Film Festival, Los Angels, Toronto Film Festivals and was also screened at the Rashtrapati Bhawan. I am an ordinary person but ‘Guru Nanak Ji’ and the Angels up there were directing it, without being present in the scene. That is my first journey. Me: How did you get to know about Sehmat Khan? Sir: Her son was in a short period of duty during the Kargil War. Through his son, I got to know about her. Me: Sir, why did you take pre-retirement? Sir: For some personal reasons. Me: Any incident that strikes your mind every now and then? Sir: Yes, once we were on a ship named ‘INS Ganga.’ We were sent off to Karachi on international borders. We flew off 30 miles away to the Karachi borders. The Pakistani army was exercising there. When in the morning they got to know that we were present. They abandoned the exercise. They became so anxious that they left two Elevators to chase our Sea-king helicopter. They could have crashed us for they were just a few meters away from us. Somehow we were landed safely. By God’s grace one by one, our Sea-kings were landed safely. It was a heart-throbbing incident happened, I cannot forget. I was the ‘Landing Safety Officer,’ who monitored it first hand. “And that’s how a true Soldier works, a big salute to you and our soldiers,” I added. Me: What do you think about Kashmiri Hindus and Kashmiri Muslims? Sir: Nothing is dividing them. They are very happy to go people. They won’t eat themselves but will serve you food. The boatman will sacrifice his own life but won’t let you suffer a scratch. That’s how the people of Kashmir are. It’s all about few people who play dirty politics because if the mothers of Kashmir would stop their children to join the ‘Jihaad’, Pakistan would not succeed in their ill mission. Me: From where does an idea to write a book strike to a soldier’s mind? Sir: I wanted people to know about the lion-hearted lady ‘Sehmat Khan’. What she has done for our country was an unknown story till then. I had traveled to Pakistan twice to collect the relative information for Sehmat had never revealed much about her past. I took time to acknowledge the truth, to find the roots. It took 8 years for me to complete the book. When I began to write, everybody told me that a book based on a woman does not do much in India but I sold the rights to the Times of India. It got published in 2008 two times. Then Penguin India came on board which is a rarity to happen and it had been published again. When I went to Sehmat with the book, I don’t think she cared much about it. All she gave me was a smile and that was much enough for me. An angel smiling at you is all you need as a reward. Sir: Have you ever seen a ‘Fairy’? She looked like a Fairy. A calm, serene, tranquil Fairy. Me: Do you believe the same that war cannot resolve anything? Sir: Yes, I do. Death of innocent people leads to nowhere. Even the History spreads the same message but it is hard enough to adapt, to perceive the truth. Those who understood became the Angels and those who didn’t have a journey to live. Me: Who was your Inspiration? Was it your patriotism that provoked you to join the Indian Army or your family who inspired you? Sir: It was a hunger then. My mother told me ‘Goli peeth pe mat khana’. Can you imagine the courage of that mother? So, our country needed soldiers and so I was inspired. Me: Sir, you have directed a beautiful film named ‘Nanak Shah Fakir’ and there were lots of controversies you had faced. Do you really think the films based on religion or Sikh gurus should not be made for it creates controversies? Sir: Yes, there were controversies but I took approval from Akal Takht. See, there is a difference when you follow a religion and you follow spirituality. When you follow a religion you are not following God but the following spirituality means you are following one soul, one God. So, I follow God, not religion. Guru Nanak Sahib was from a Hindu family and he spread the message of ‘Ek Omkar’ that means ‘God is One.’ He also said that ‘A woman should not be demeaned as she gives birth to the kings’ but the highest women infanticide is in Punjab. So, here the people are not following spirituality, they are following religion because they are not even following the teachings of the Guru Nanak. They were the people of Khalistan who reside in Pakistan. They hated my book ‘Calling Sehmat’ and so they banned my film ‘Nanak Shah Fakir.’ They also banned film Raazi in Pakistan to release. But fortunately my book was the number one bestseller, film Raazi is the blockbuster and my film ‘Nanak Shah’ won three national awards. An angel from up above was blessing me. Me: A motivational message from you to the generation. Your justice will be done by God. His plans for you can never ever be unjust. That’s what Sehmat told me and that’s what I truly believe in. I have invested my soul to complete my book. So, find the message it gives. That gentle lady, who was a treasure to her parents, a level-headed, pragmatic citizen of the Nation, a responsible spy, a brave heart soldier of the country. She was so loyal towards her duty and the Nation that she killed her husband, didn’t marry his boyfriend, didn’t accept his child when she came back to India. Can you imagine how strong she had been for those years? She died silently, the way she wanted to be, in deep sleep. So, always respect her sacrifices for the country. Save yourself from glitters and jealousy. My humble gratitude to him. One in a million he is. A big salute to the Indian Soldiers. ⟵Celebrate The Milestones In Your Journey To Big Success!